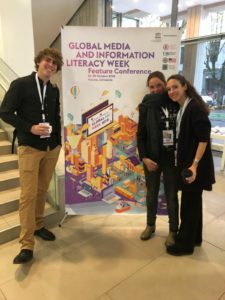 On October 24 and 25, 2018, our team was present at the UNESCO Global Media and Information Literacy Feature Conference in Kaunas, Lithuania. Hemmo Bruinenberg presented MMM in the session ‘Youth, social media activism and social inclusion of migrants’. In an interactive session Hemmo showed examples of the work we do with young newcomers, did a practical exercise from our lesson plan and shared some of the latest insights. The next day team member Ena Omerovic, who is also part of the Media and Information Literacy Expert Network (MILEN) from Deutsche Welle, presented on the role of representation of refugees and migrants and the MMM project. The session was hosted by MILEN to get input for their new network. All together, our team was very present during the conference. Even project manager Sanne Sprenger, who lost her voice just before the conference, made useful connections with some of our Swedish MIL colleagues. We certainly will hear more about this in the future. Last but not least, team member Hemmo Bruinenberg got recognized for another project in the field of MIL: the Ithaka Film Festival, a visual literacy project with the same students MMM is working with – young newcomers. 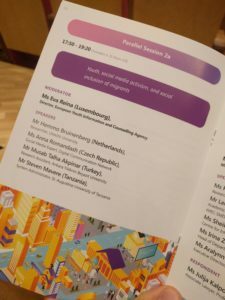 During the opening session Hemmo received the Second Prize of the Global Media and Information Literacy Awards 2018. Read more about it here.